The Certified Fiber Optic Specialist Splicing (CFOS/S) training program is a two and a half day course. The course format is a mix of lecturing and hands-on practice. It will provide students with the opportunity to learn several techniques for splicing fiber together. Intensive tutoring by the instructor will give each student ample opportunity to ask questions and receive one-on-one tutoring. All necessary hand tools and test equipment will be furnished by Nine Micron Inc. This course equips you with the knowledge, skills and confidence so you will be ready to hit the ground running. The Certified Fiber Optic Specialist in Splicing course covers the intricacies of fusion splicing. This course focuses on developing the skills needed to splice both single strand and ribbon strand fiber cable. Along the way, the student will learn about the problems that can arise. Things like splicing process planning, safety, fiber scrap management, workspace cleanliness, tool maintenance, cleaver cleaning and maintenance, splicer cleaning and maintenance. A strong emphasis will be placed on practicing ribbon splicing. The student will have to learn how to prepare the ribbon, cleave the ribbon, and splice the ribbon. While it is a simple task, it is definitely not an easy task. 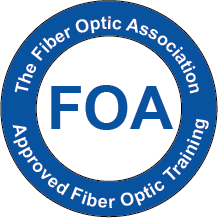 If you are pursuing official FOA certification then you should have your CFOT already. If you are not then you should have equivalent knowledge and experience in fiber optic communication technology and installation processes.